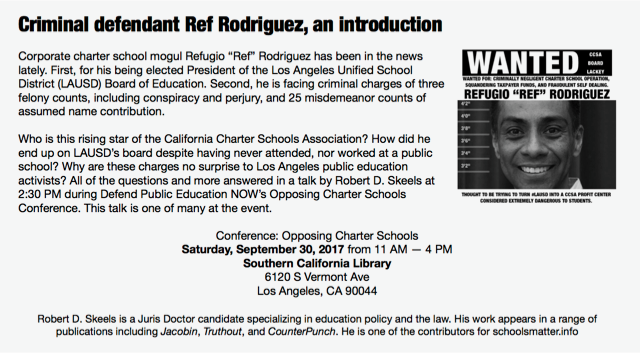 Corporate charter school mogul Refugio “Ref” Rodriguez has been in the news lately. First, for his being elected President of the Los Angeles Unified School District (LAUSD) Board of Education. Second, he is facing criminal charges of three felony counts, including conspiracy and perjury, and 25 misdemeanor counts of assumed name contribution. 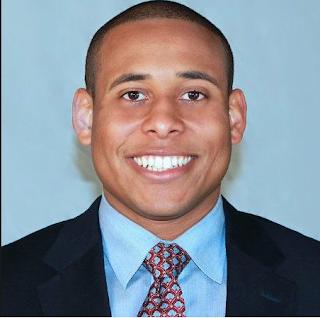 Who is this rising star of the California Charter Schools Association? How did he end up on LAUSD’s board despite having never attended, nor worked at a public school? Why are these charges no surprise to Los Angeles public education activists? 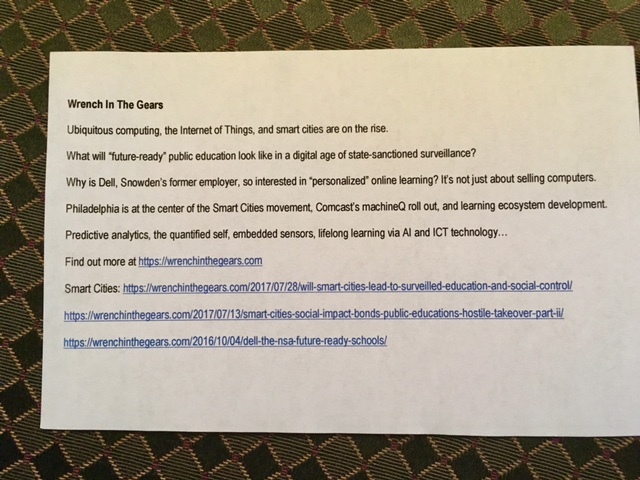 All of the questions and more answered in a talk by Robert D. Skeels at 2:30 PM during Defend Public Education NOW’s Opposing Charter Schools Conference. This talk, and topic, is one of many at the event. Change starts with individual acts of moral courage. It seems impossible until the day it becomes inevitable. 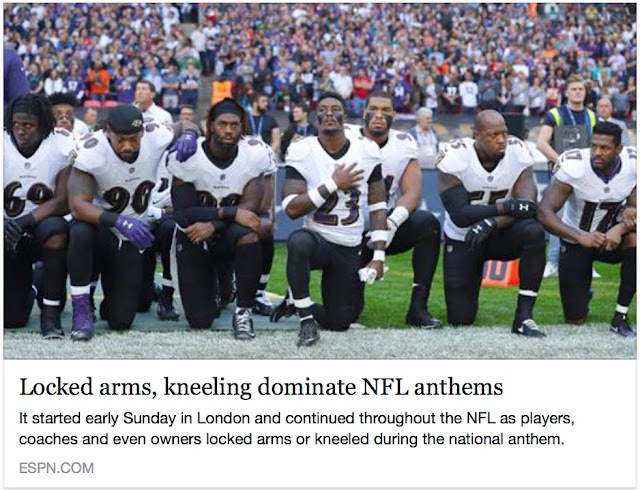 I posted the above comment on my Facebook page as an accompaniment to this article discussing growth of the protest movement within the NFL that manifested itself this past Sunday. On that day numerous players and owners allied themselves with a small but tenacious group of protestors who had joined Colin Kaepernick in the year since he first sat then took a knee during the playing of the national anthem. 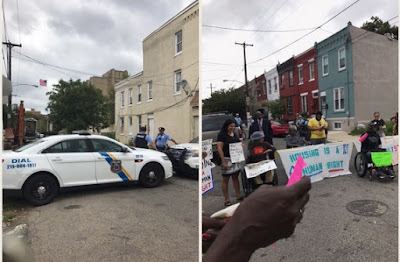 His intention: to draw attention to police brutality and oppression of people of color. 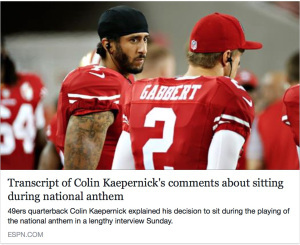 You can read the transcript of Kaepernick’s comments and rationale here. Recognizing that our mythic “America” is built on genocide and the enslavement of people of color for profit is foundational to being able to move forward towards achieving any semblance of a just society. The fact that white supremacist violence erupted in Charlottesville not quite a year after Kaepernick’s initial protest makes it clear many are not yet ready to take that bitter pill and reconcile our brutal past with our present reality. Kaepernick stood alone for a long time. There were consequences for him, emotionally and financially. He came to understand systems of oppression, and while he could have used his privilege to stake a place where those systems would be less likely to impact him, he instead chose to put himself in the center of the storm. In this individual gesture he became the pebble with the power to unleash the avalanche. The status quo resists change mightily. There is too much power and profit riding on the continuous, uninterrupted operation of oppressive systems. 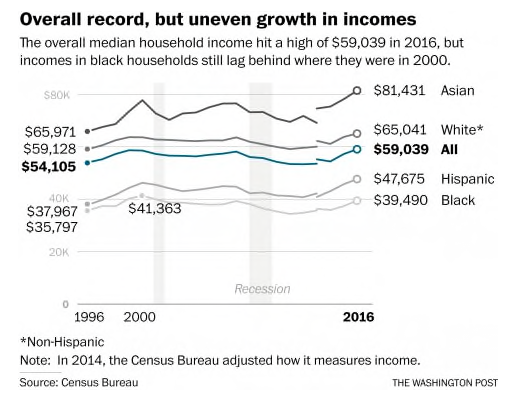 Those of us watching recent developments in artificial intelligence, smart city surveillance, the Internet of Things, Blockchain, and impact investing realize the capacity to inflict harm on black and brown communities is about to rise exponentially. Outliers who question become targets of criticism, their message intentionally obscured by character attacks, criticism of the appropriateness of the method protest and other technicalities. Let us talk about anything other than the issues being raised, because recognizing and organizing around those issues could compel change, perhaps revolutionary change. Change is a threat. While one expects criticism from those holding opposing views, people contemplating direct action outside acceptable norms of group-sanctioned protest must realize that criticism and obfuscation may also come from those technically allied with your cause. There are those who will propose a more “moderate” approach. Such tactics have the appearance of resistance, but are not intended to actually tip the apple cart. There is no meaningful change without risk. Actions taken within the comfort of groupthink may make one feel popular and accepted but are unlikely to push the envelope in any significant way. American brutality comes in many forms: sometimes physical, sometimes financial, sometimes spiritual. Sometimes it looks like this. Will you be a Kaepernick? Or will you hang back, waiting for some higher authority to sanction your protest? It's not often that the unofficial matriarch of anti-ed reform gets called out for her support of the corporate education forces that she would, otherwise, have us believe that she opposes. When it does happen, however, as it did a couple days ago when Emily Talmage questioned Diane's recent gush about the virtues of the MacArthur Foundation, Ravitch's reaction is entirely predictable: she accuses those with the temerity to question her professional judgment or her policy positions as "lashing out" with personal attacks against her. It is Diane's ruthless cultivation of sympathy among her followers, then, that takes the focus off the questions raised about her positions and puts it on the motives of the person who raises the questions. In doing so, Ravitch transforms the skeptical questioner into a mendacious meanie, whose criticism, then, can be dismissed outright. Ravitch, then, effectively uses the personal attack strategy that she attributes to others in order to neutralize any criticism of her own positions, which are predictably aligned with DNC neoliberals and increasingly out of touch with reality. You should go to the Talmage page first and read the post that has Diane's Basecamp followers waving their limp swords at the imaginary attacker. And then read Ravitch's response. I think you will see what I mean. As I see it, the state-finance nexus (banks/financial markets/corporations; state, federal and municipal governments; NGOs; philanthrocapitalists; DNC/RNC; white supremacy, colonialism, militarized austerity, etc.) that’s driving Ed Reform 2.0 is maintained by duplicitous mission statements, promotions, pronouncements, marketing agendas and ideological/cultural narratives. This profiteering web of deceit also relies on dedicated pundits like Ravitch, who earnestly, implicitly and duplicitously promote and normalize this agenda, while presenting themselves as benevolent agents of the common good. One of the rules of the blog is that I don’t post comments that insult me. The blog is my living room, and I expect people to act civilly, even though we debate, disagree, and hash out our differences. 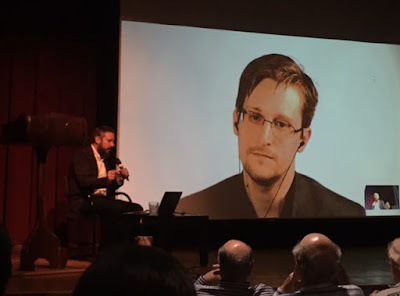 It is a lively room, and I try to keep the conversation civil, which is not always easy. 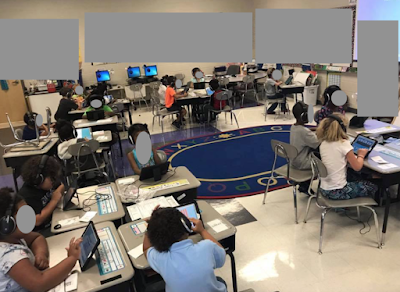 I am making an exception in this case because it is useful for other readers to hear your voice and understand that those of us who fight privatization, high-stakes testing, standardization, and the replacement of teachers by algorithms are not united. If you think I am your enemy, you have a very strange understanding of what I have written in books, articles, and daily blogs for the past several years. Since you have identified me as an enemy of the cause I fight for every day, I will ask you not to return here again. This, again, is pure Ravitch: Use the cover of civility to ruthlessly remove any opposition. If you have had your comments censored by the Ravitch crew at her blog for being uncomfortably honest, send us your offending comments, and we will post them here for public scrutiny. 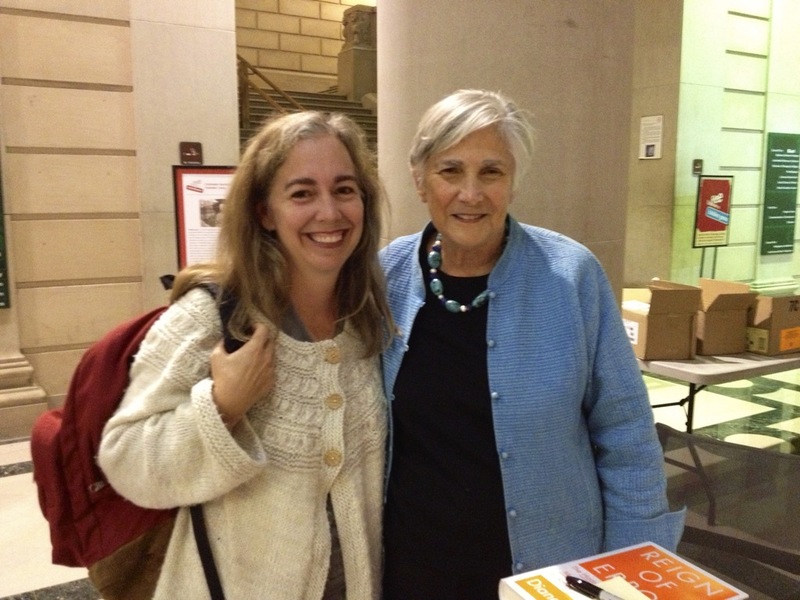 Alison McDowell with Diane Ravitch at the Free Library of Philadelphia in 2013. Elementary and secondary schools with large numbers of black and Hispanic students are less likely to have experienced teachers, advanced courses, high-quality instructional materials and adequate facilities, according to the United States Department of Education's Office for Civil Rights. Until corporate predatory charter schools stop churning out miseducated robots and until our leaders take steps to end segregation and until racist and classist standardized tests are discontinued, black and brown representation in the best universities and colleges will continue to decline. Last year white Alice Walton, New York hedge fund whales, and other Wall Street parasites poured $19 million into an effort in Massachusetts to increase the number of charter schools in the state by eliminating the state cap. With the help of paid actors and parents who don't know or don't care that their children are being brutalized daily in the charter cultural sterilization camps, large rallies were staged on Boston Common to make it appear that black and brown folks were demanding more charter schools. The voters of MA weren't fooled. Tired of having their public school funds go to corporate predators posing as educators, the citizens turned back the charter industry effort in the November referendum. A wealthy New York organization that poured $15 million into last year’s unsuccessful ballot question to expand charter schools in Massachusetts was hit Monday with the largest fine in state campaign history after officials found the group was illegally hiding the identities of its donors. Families for Excellent Schools-Advocacy, a nonprofit that was the single largest funder behind Question 2 in Massachusetts, was slapped with a $426,466 fine, the largest in the 44-year history of the state Office of Campaign and Political Finance. The group was also forced to reveal its donors — showing it was anonymously receiving major checks from two Baker administration officials and numerous wealthy contributors from the world of high finance in Massachusetts, New York, and other states. . . .
We still need librarians in public schools. Congratulations to the Tribune for informing the public about the lack of school librarians in Chicago. Not mentioned in the Sept. 5 article “Most of city's schools now lack librarians,” however, is the research showing that the presence of a credentialed school librarian is a significant predictor of reading achievement. A recent study done by Scholastic tells us at least part of the reason why: School librarians connect young readers with books that are right for them. This is crucial. Research also tells us that students who develop a reading habit read better, write better, spell better, have better control of grammar, and have larger vocabularies. Readers also know more about a wide variety of subjects. It is therefore no surprise that they do better on standardized tests of literacy. We cheerfully spend billions on unvalidated tests and untested technology, yet we ignore the impressive research on libraries and librarians, and are unwilling to make the modest investments that will ensure that school libraries are well supplied with books and are staffed with credentialed librarians. Or, how my day would have been very different had I worn khakis. 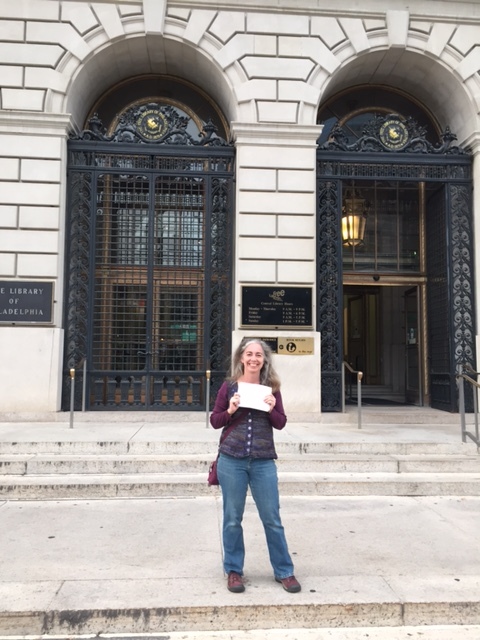 This is a story about access. Who has it, who doesn’t, and how in order to save public education, people, especially people of privilege, need to take a page from the Ed Reform 2.0 handbook and start actively disrupting. 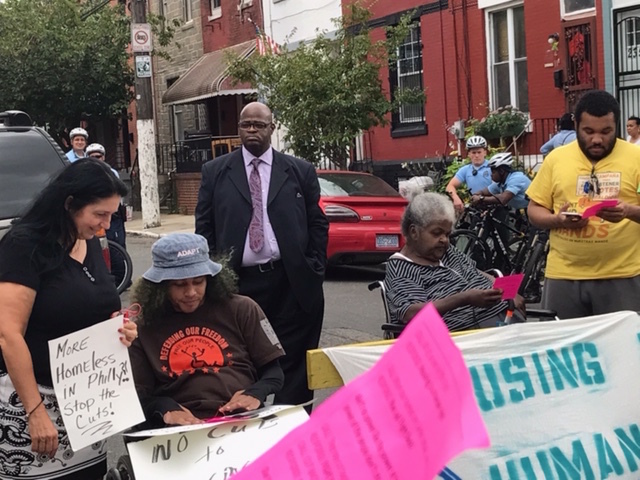 Showing up (and sitting down) can build awareness of critical issues and catalyze the direct action we need to ramp up our defense of neighborhood schools against predatory venture capitalists and the so-called “community partners” who benefit from education austerity budgets. The latter, those non-profits NOT actively speaking out to secure public funds for public schools but rather accepting funds from private interests to fill the myriad gaps created in our schools through intentional defunding, are not acting in good faith and are not allies. It was a busy morning. Before I hopped on my bike into Center City Philadelphia I double-checked my supplies. 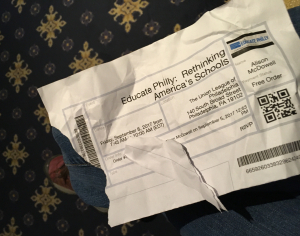 I had printed a paper copy of my Eventbrite ticket to “Educate Philly: Rethinking America’s Schools,” a reformy book launch and panel discussion over breakfast with David Osborne of the “radically pragmatic” Progressive Policy Institute. The event page noted “If you believe in the virtues of a public education AND are willing to be challenged – join us for breakfast this Friday, September 8th for a compelling conversation on public education.” If I had only known the level of “challenge” attending this breakfast was going to pose, I would have had my coffee before leaving the house. 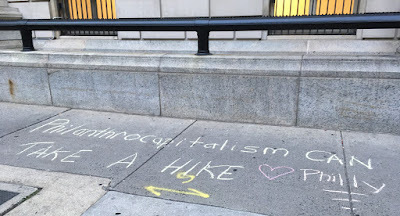 I had sidewalk chalk and a Ziploc bag with slips of paper of printed with sentiments that expressed my displeasure with the corporate plan to “reinvent” public education for the 21st century by creating impact investment opportunities predicated on the data-mining of students through ubiquitous online “personalized” learning programs. My ticket, which was torn when Union League staff tried to grab it out of my hands.